Not all sapphires are blue. In fact, sapphires come in many colors, from champagne to pink to peach, purple, orange, and green, to completely colorless. Trace minerals are what give sapphires their range of hues. Our fave is the peach. With its subtle blush, from pale champagne to a fruity golden, peach is the rarest color for sapphires and is a great alternative to pink diamonds and morganite (which lacks the hardness and sparkle of a sapphire). View our collection of these beautiful sapphires. As we said above, trace minerals are what give sapphires their range of hues. White sapphires, on the other hand, are completely devoid of any trace elements, which is why they are quite rare in nature. They can be made in the lab, however, and are an excellent–and less expensive–alternative to diamonds. We feature a range of beautiful white sapphire wedding sets and eternity bands. Found in southern Oregon, and so named for its warm shades of gold, orange, reds and browns, the sunstone projects an iridescence or spangly effect when looked at from different angles. These are caused by inclusions of minerals — typically red copper — in the stone’s crystal layers. The more copper within the stone, the darker its hue. Check out some of our beautiful Oregon sunstone rings. Like the emerald, the aquamarine is a color variant of the mineral beryl and is found in nature in the highest peaks of the Karakoram Mountains in Pakistan, according to our friends at the Gemological Institute of America. The name comes from the Latin word for seawater and is the birthstone of people born in March. The stone is also purported to elevate the happiness quotient in a marriage (and why wouldn’t you be happier with this stone on your finger?). While less durable than a diamond or sapphire (it ranks 7.5 to 8 on the Mohs scale, to the sapphire’s 9, moissanite’s 9.5, and the diamond’s 10), it certainly rivals both in terms of its beauty, sparkle and unique color. See our beautiful Rosados Box collection of aquamarine engagement rings and wedding sets. We just can’t get enough of these gorgeous gemstones, made entirely in the lab and the number-one diamond alternative of choice for socially conscious consumers. Moissanite is a natural mineral, composed of silicon carbide, that offers a similar sparkle, hardness, and durability as a diamond but is less expensive. In fact, the Forever One Moissanites that we carry from makers Charles & Colvard shine brighter than a diamond! 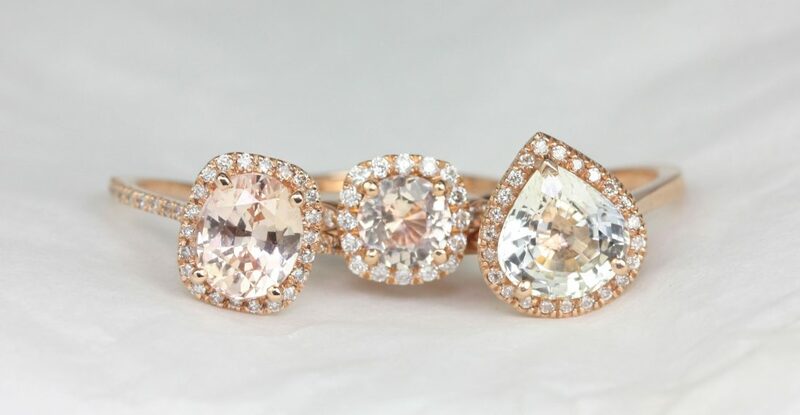 See our extensive Rosados Box moissanite rings. Like all of our gemstones, we handpick each and every sunstone, sapphire, aquamarine, and moissanite that goes into our jewelry so that you can rest assured you’re purchasing a top quality, conflict-free stone that reflects your love and values.